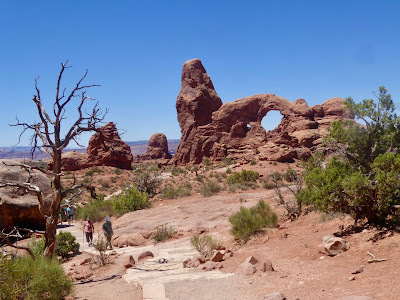 North Window, Arches National Park. Photo © by Judy Wells. Our first morning in Moab we made a beeline to Arches National Park. First stop, the Visitor's Center. Judy at the center. Photo by Debi Lander. 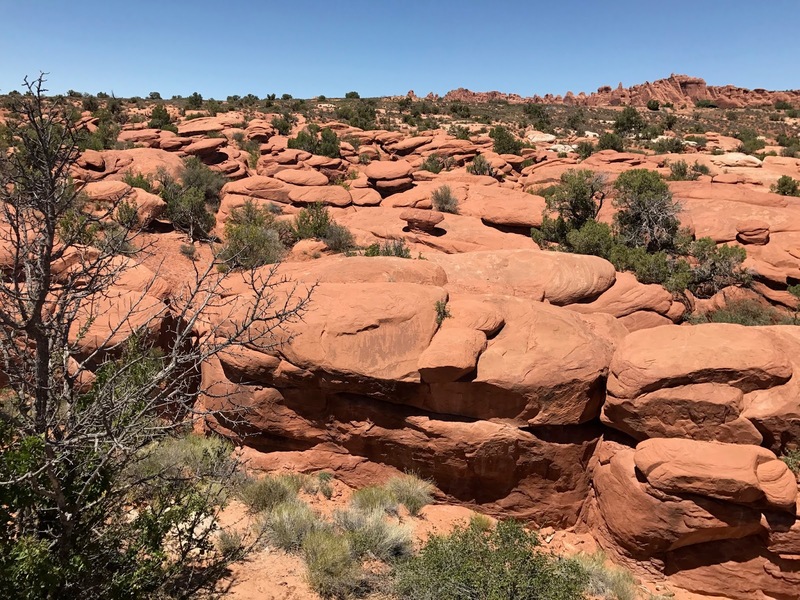 Even at this point the red rock formations are breath-taking and we can't wait to see the "stars" but we stick to our routine; watch the introductory film and swing through the gift ship. 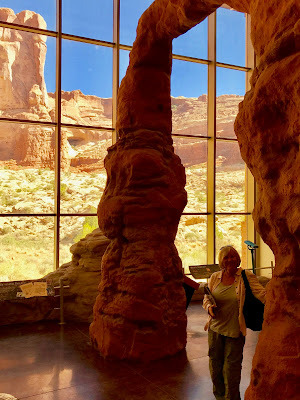 Debi checks out the exhibits while the real thing waits outside. Photo by Judy Wells. Well worth it. 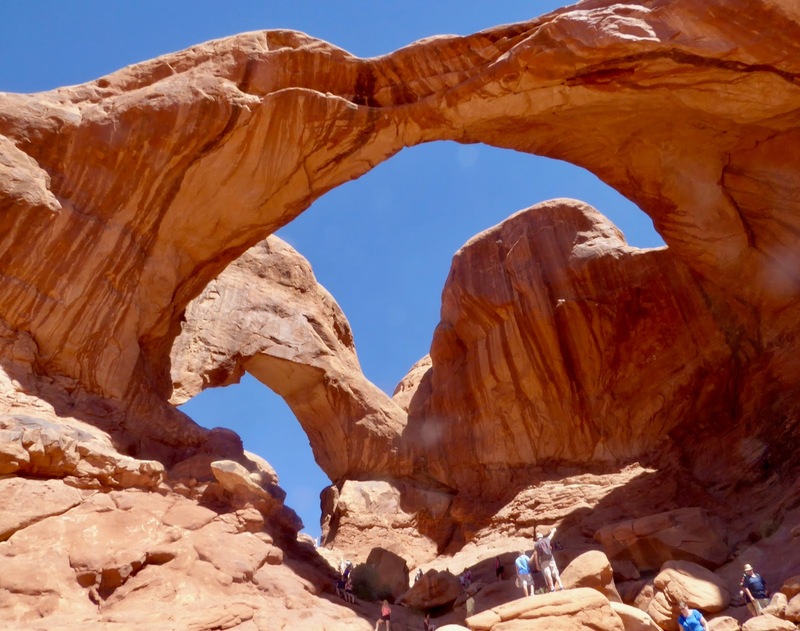 It is the best film we have seen in our visits to national parks and now we actually understand how arches, the rarest of geological formations, develop. Water is the architect and if all conditions are perfect, it seeps into crevasses and weaknesses in the sandstone, expands and contracts with the weather and after centuries and eons an arch is formed. 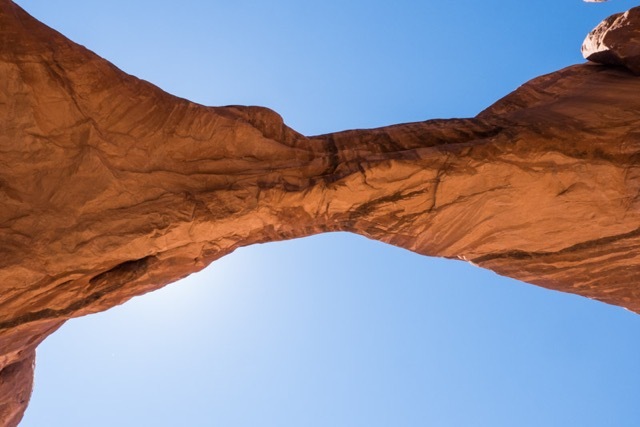 Ironically, the same forces that form an arch also destroy it. 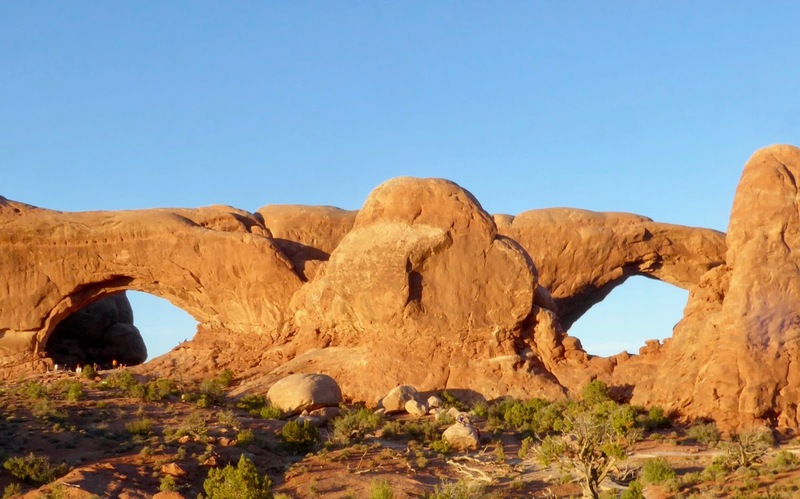 It's an arch if over land, a bridge if over a body of water. We also picked up a new catch-phrase, Don't bust the crust. You see it on signs all over the park because that crusty, blackish stuff you see on the ground is known as "biological soil crust." 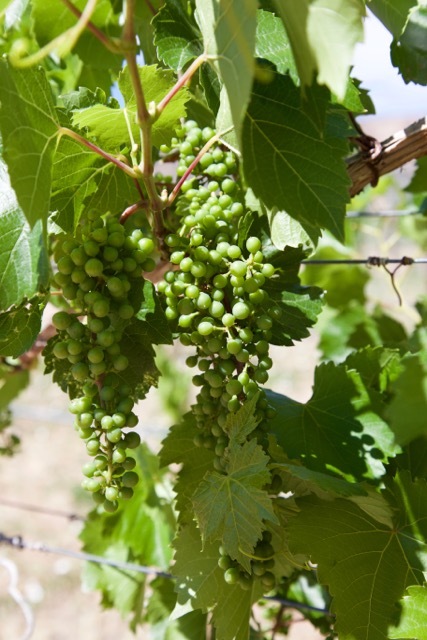 A mixture of bacteria, mosses, lichens, fungii and algae, it is essential to other plants and in preventing erosion. It is so fragile that one step can wipe out years of growth, a very important reason to stay on the marked trails and paths. Reluctantly, knowing how many clutter our cabinets at home, we buy water bottles; there are is no food or beverage service in the park and it is already getting hot. 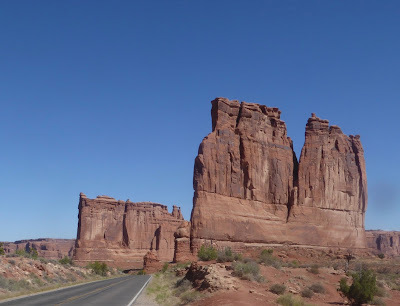 Arches' Park Avenue. Photo © by Judy Wells. It is also getting crowded. It takes two passes to find a parking spot at the Park Avenue viewpoint. So named because the towering cliffs reminded someone of Manhattan's skyscrapers, we ooh and aah like everyone else as we take photos. 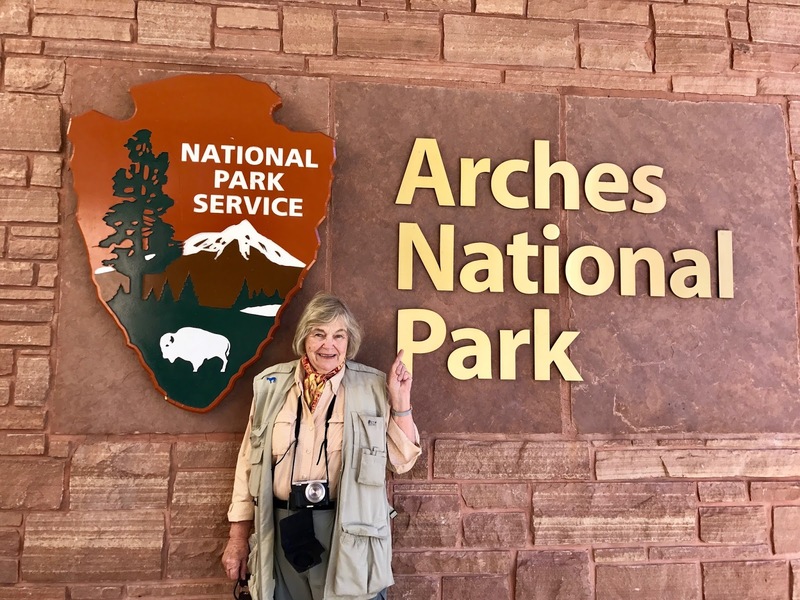 Guide's audio tour of Arches and Canyonlands National Parks. It is a good buy although using it as a directional guide is frustrating as signals fade in and out. 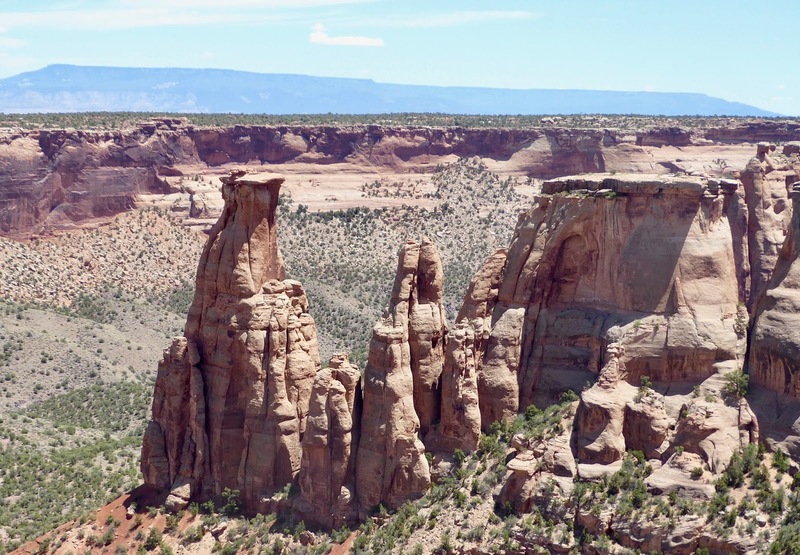 Fins, the formations that can produce arches. Photo © by Judy Wells. 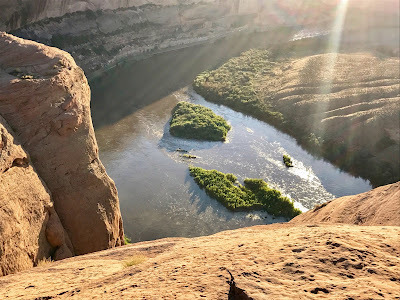 We are equally awed at Courthouse Towers viewpoint, vowing to return when light is better and traffic less to see and capture formations like the Three Gossips. Petrified dunes. 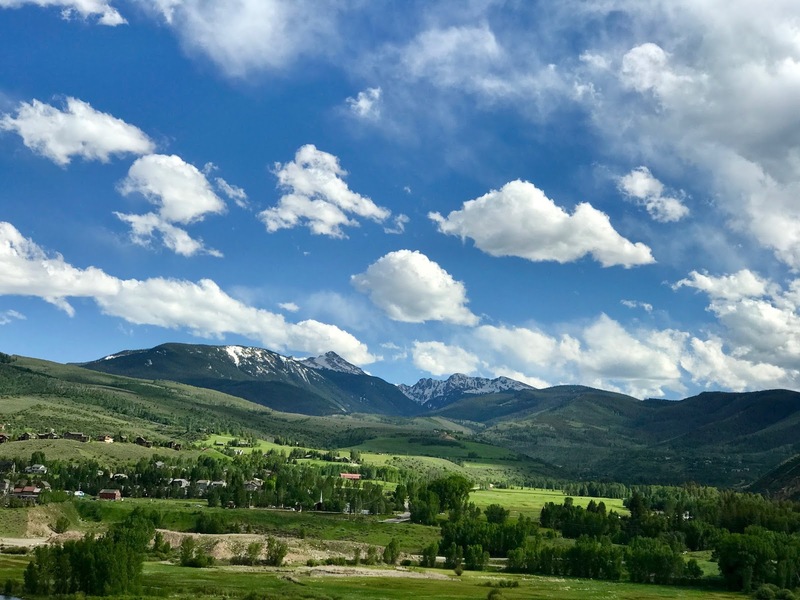 Photo by Judy Wells. Petrified Dunes remind us that Arches went through several periods as an inland ocean. 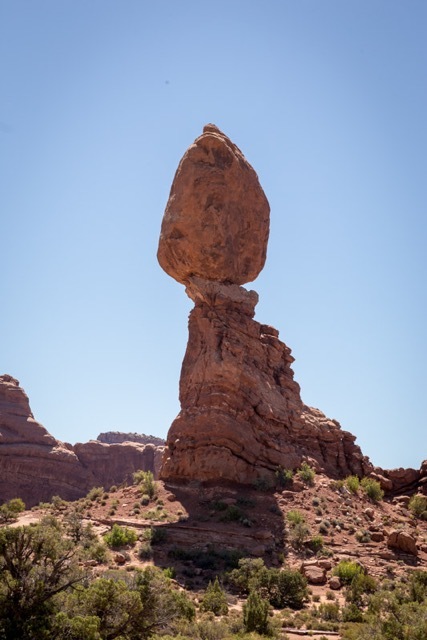 Balanced Rock makes a good landmark. Photo by Debi Lander. 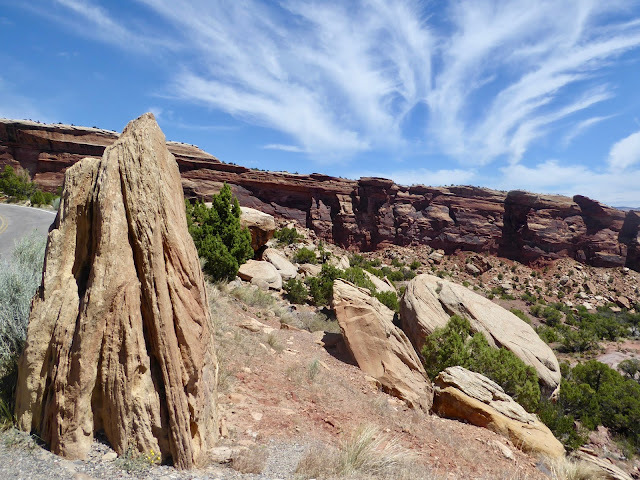 Spotting Balanced Rock ahead tells us the turn to Double Arch and the Windows is near. 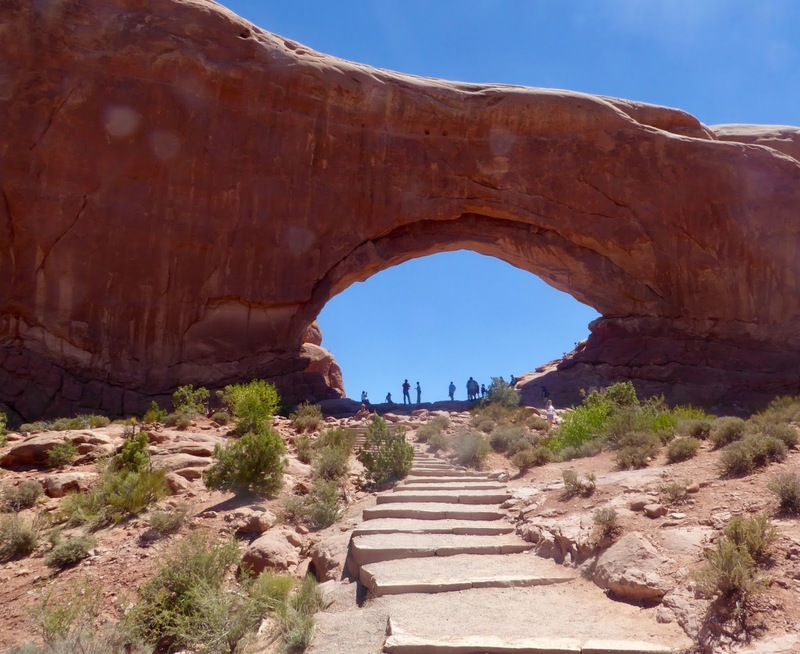 Double Arch is a visitor favorite. Photo © by Judy Wells. This is the largest and most crowded parking area of all and again, we need two circuits before a spot opens up. If you see nothing else, don't miss these. We began with Double Arch, perhaps the most spectacular formation in the park. It is massive, on a scale you can't imagine until you stand at its feet. Looking up. Photo by Debi Lander. Many climb up into it. 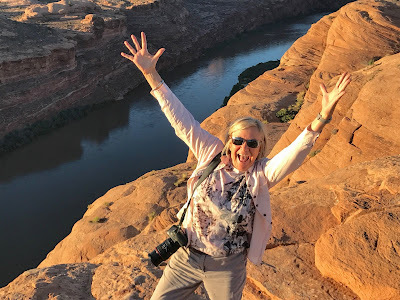 Debi did, I didn't and we both came away in awe, our cameras filled with astounding images. North and South Windows. Photo © by Judy Wells. Turret. Photo © by Judy Wells. Across the parking lot are our second favorites, North and South Windows and Turret Arch. I head for Windows, Debi to Turret. It's a trek up endless steps to Windows, but these, too, are massive. Turret is easier to reach and at first glance, isn't that impressive but once there, the view is spectacular. You can see both Windows at once plus several hoodoos. 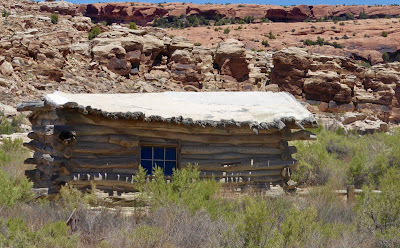 Wolfe Ranch. Photo by Judy Wells. 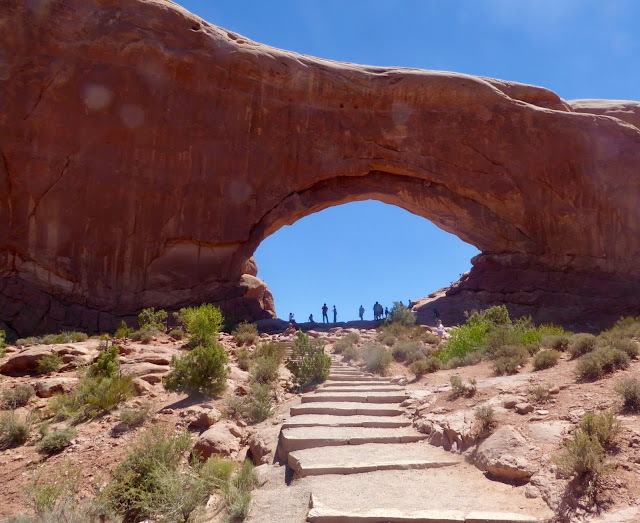 We tear ourselves away and head to Fiery Furnace and Delicate Arch. Fiery Furnace lives up to its name; cliffs block any stir of air and reflect the sun back at us across a wide canyon. 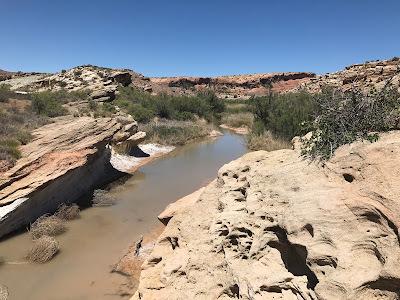 We stop at what is left of Wolfe Ranch, the house a wounded Confederate veteran and his eldest son built, the corral and a storage cellar along Salt Wash, now Creek, on 100 otherwise arid acres in the late 1800s. They left 10 years later. Salt Creek. Photo by Judy Wells. 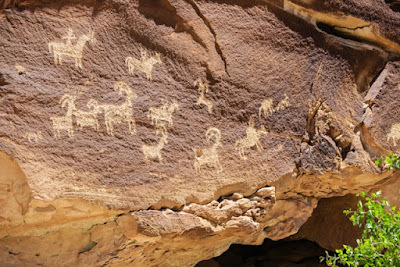 Ute Petroglyphs. Photo by Debi Lander. We cross Salt Creek and head up to a cliff to see Ute petroglyphs carved in the 17th century then headed on to the Delicate Arch viewpoint. Delicate Arch. Photo by Debi Lander. Hot, tired, thirsty and hungry, we decide to settle for a distant view instead of hiking up a long, steep trail across slickrock and rubble. 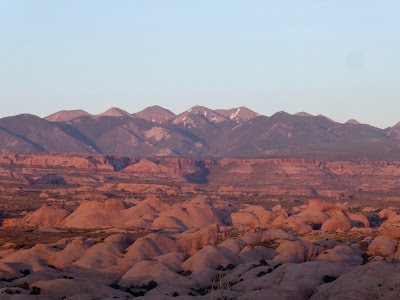 La Sal Mountains, Photo by Judy Wells. We understand how the first Spanish explorers of this region refused to believe that in such a hot place snow could exist atop the mountains just south of here. They decided it must be salt and the local natives obligingly showed them salt deposits at the range's foot. 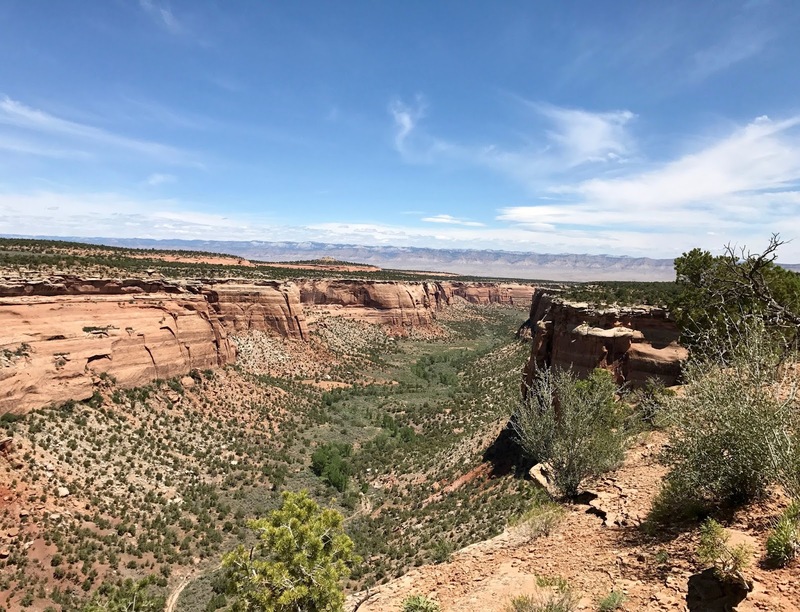 Thus the name of the range, La Sal, salt. It is snow though, and they form a scenic but teasingly cool-looking backdrop. The road to Devil's Garden, also on our list, is closed for construction. 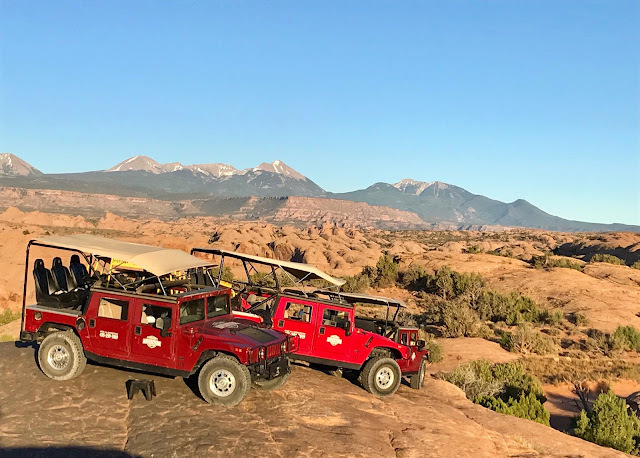 With a combination of disappointment and relief, we head back to Moab to spend the steamy afternoon like the animals here do, resting in a cool place. 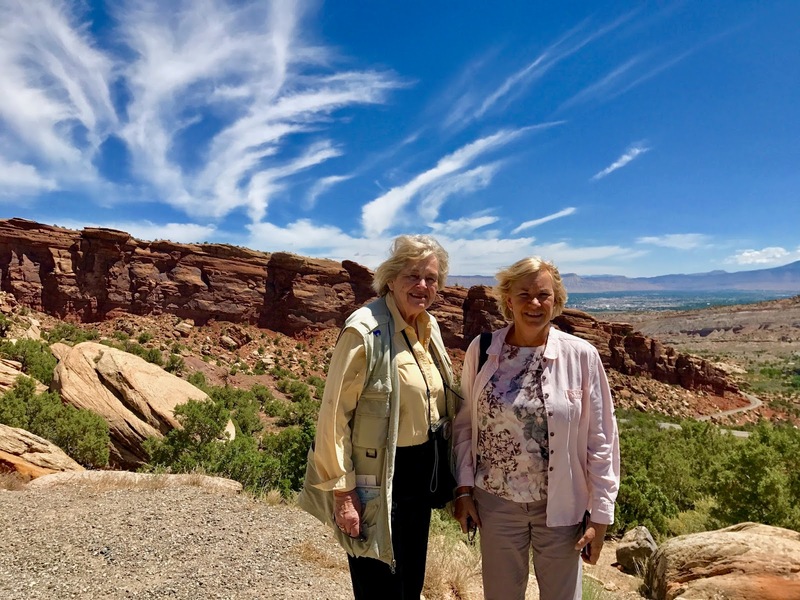 After showers and respite, we walk through Moab and treat ourselves to a superb meal of lasagna and wine at a popular Italian restaurant. 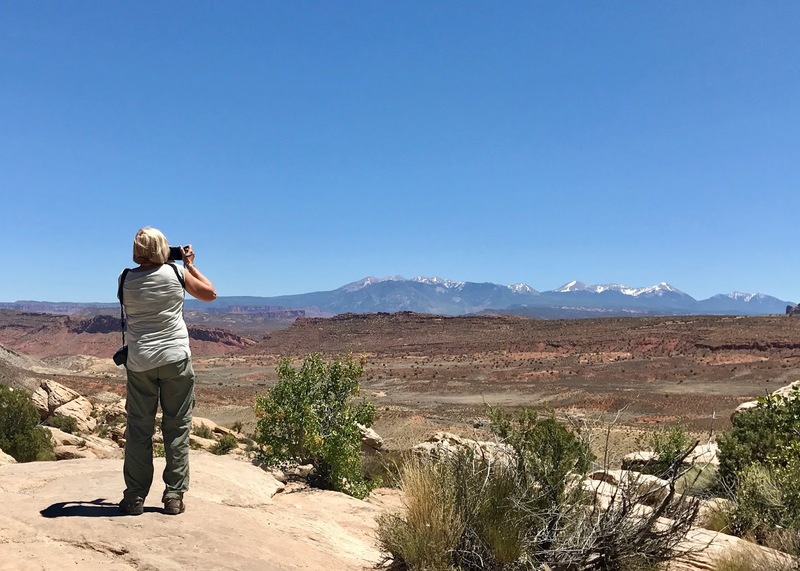 The food was a lot easier to digest than the amazing sights we have witnessed of what Nature can produced and the National Park Service is working to preserve. 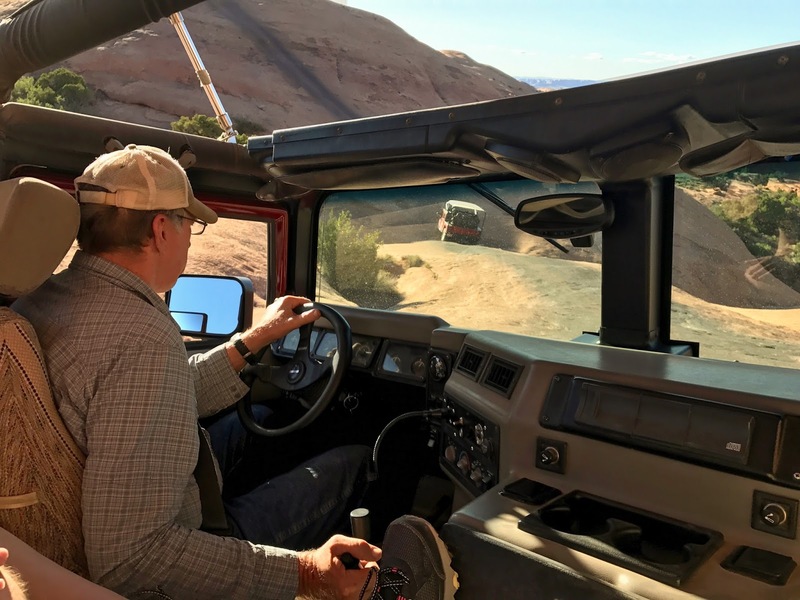 Mike, the driver announced, “Here we go,” and our vehicle began jostling up a red rock fin at a 30-degree grade, but it felt more like vertical. The Good Girls and fellow passengers bounced in the seats like bobblehead dolls. 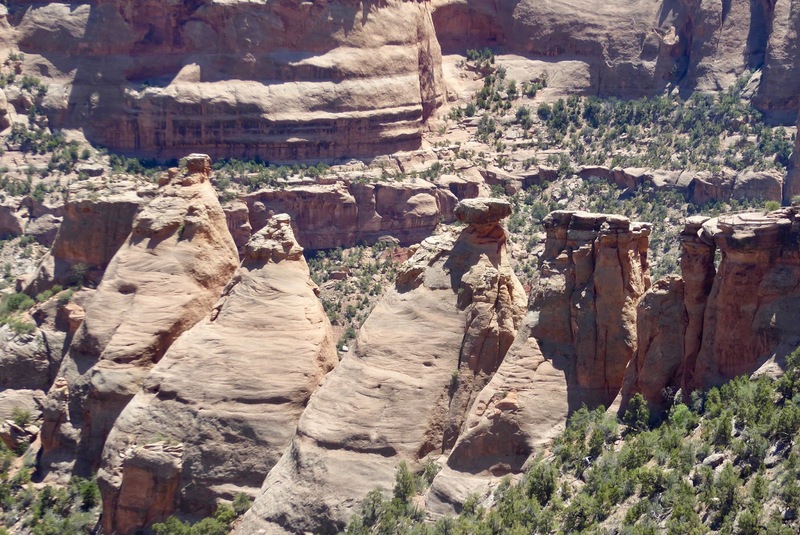 Scaling toward the summit, the sides of narrow path dropped to reveal a miraculous rock canyon below. 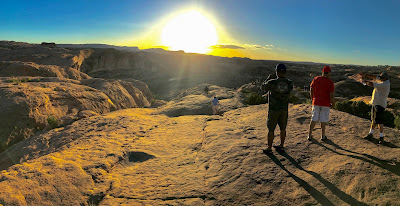 Astounding, and we had just begun our off-road Sunset Hummer Tour of Hell’s Revenge in Moab, Utah. Mike takes the controls of the Hummer. Photo by Debi Lander. 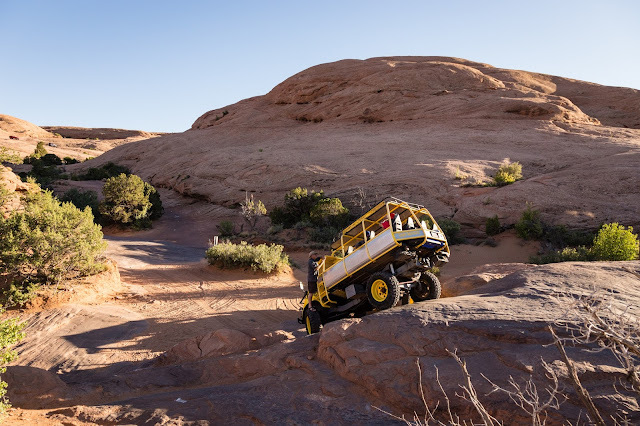 “Never fear,” said Mike, “This Hummer can pass through deep ditches and traverse large dirt mounds without suffering any front or rear end damage. It can scale a 60-degree slope, but we’re only planning to encounter a 40-degree rise.” Thankfully, our tour made no attempt to climb the infamous Escalator or Hot Tub trails in the park. The Red Hummers have no trouble maneuvering through the park. 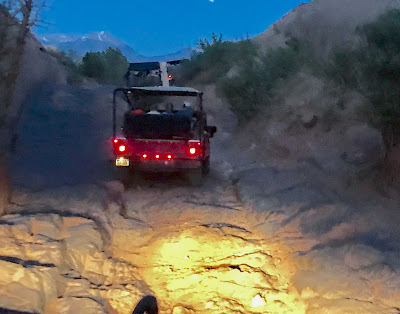 Our hearts pounded as we bravely smiled and nodded at one another for reassurance, but our driver never missed a beat, continuing with confidence. He began the descent of the steep sandstone hill nicknamed the Roller Coaster. I don’t know if I was more jazzed by the thrill of the ride or the wickedly wild landscape. A slow roller coaster to the top. Photo by Judy Wells. Stopping for a look at the canyon below. Photo by Debi Lander. 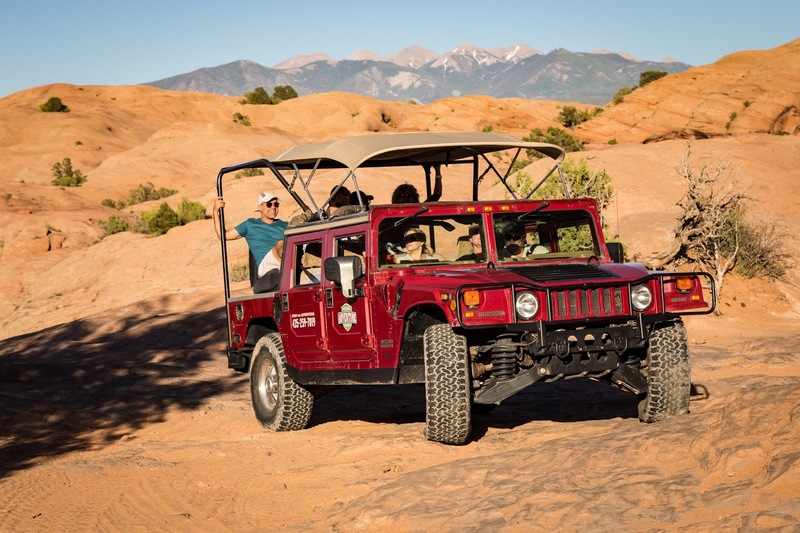 Hummer Tours through Hell's Revenge. Photo by Debi Lander. The Good Girls were headed to Arches and Canyonlands National Parks, both near Moab, the adventure capital of Utah, Our juices started flowing as soon as we crossed into Utah. After the speed limit rose to 80 miles per hour, we encountered a warning sign along the highway, ” Eagles in the road.” What did that mean? A few miles later exit signs began to warn of “No Services”, begging the question of who would dare turn off? At our age, we don’t go for extreme physical adventures, treacherous mountain bike trails or Class 4-5 white-water rafting. We settle for speed and automotive thrills and thought a Hummer ride would fulfill our needs. 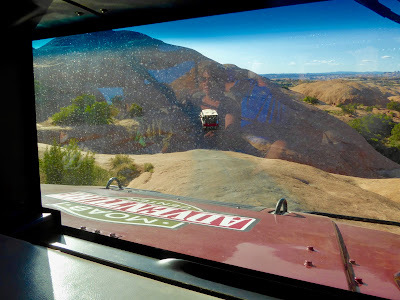 So, we signed up and purchased tickets for Sunset Hummer Tour from the Moab Adventure Center. 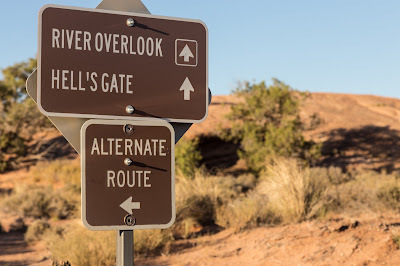 The path through the canyon is very confusing. Debi Lander. 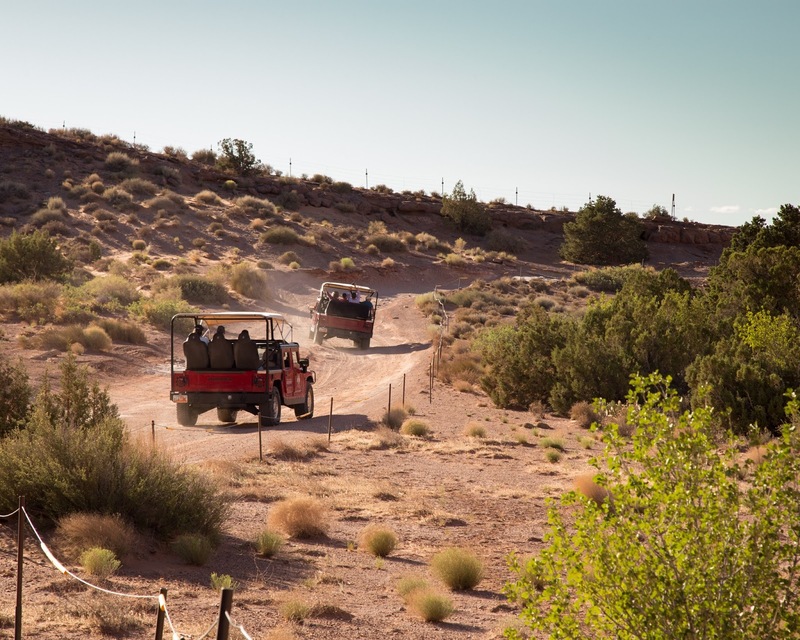 Moab cozies up to the banks of the Colorado River between eye-popping red sandstone cliffs. 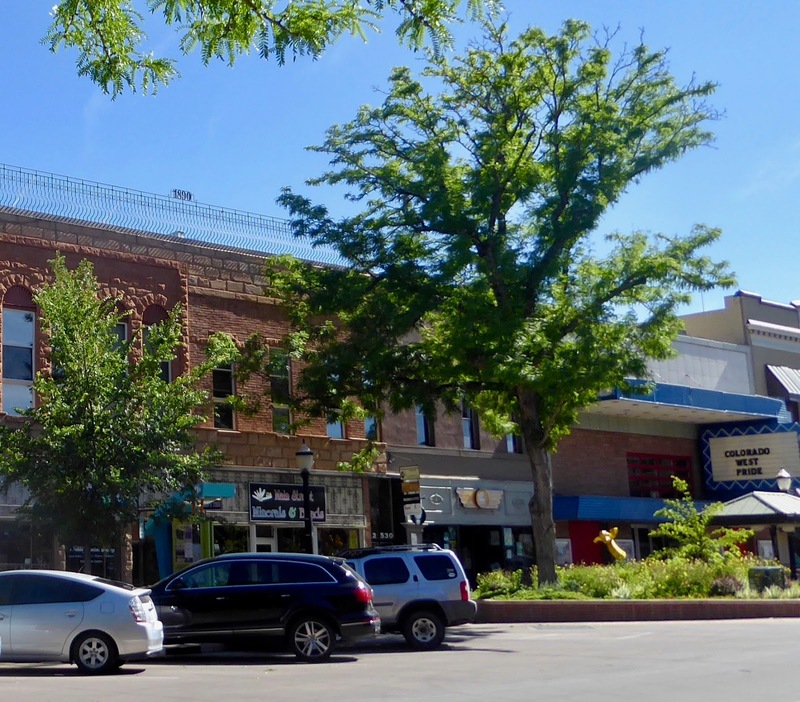 The National Park gateway offers Mom and Pop type lodging, restaurants, and outfitters along Main Street. The surrounding scenery attracts millions to hike, bike, and camp around windswept rock domes, magnificent mesas and otherworldly rock formations that conjure up imaginary faces and places. 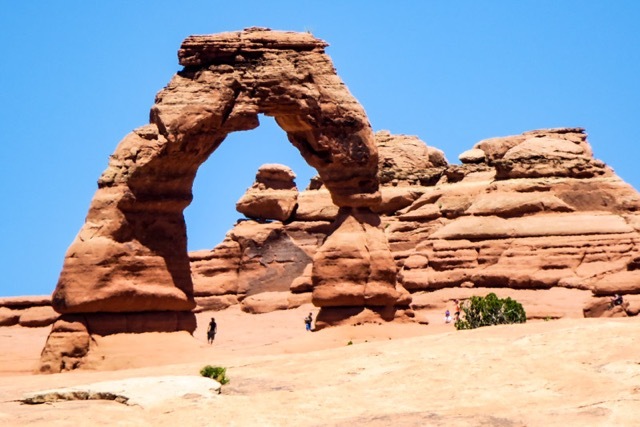 No surprise that filmmakers have used the craggy region as a backdrop in films such as City Slickers, Indiana Jones and the Last Crusade, and our favorite, Thelma & Louise. 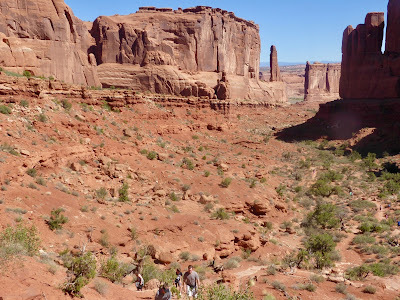 So there we were gasping with excitement as Mike veered up and down the zigzagged trail. After about 15 minutes, we stopped, caught our breath, and took in at the blazing spires and valleys. The riders from all the Hummers in our group gathered to hear a geographical explanation of the canyon sliprock: outcroppings of smooth weathered sandstone - - great for biking but dangerous for hiking because you can lose your footing. 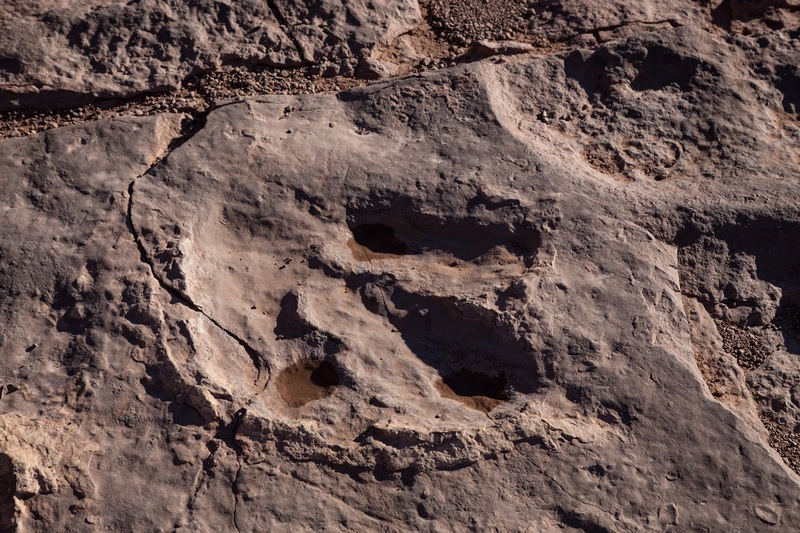 The guide also pointed out some fossilized dinosaur tracks. How very cool. Fossilized Dinosaur Tracks. Photo by Debi Lander. The groups returned to the vehicles to attack the craziest, most rugged section of the trail, venturing up seemingly impossible rises and then carefully easing back down. Thankfully, Mike proved his worth as a sure-footed driver. We stopped again for photos and a chance to test out echoes in the canyon. Yes, the incline is breath taking! Eventually, the group snaked up to a panoramic overlook, and peered down a gorge through which snaked the winding Colorado River. I sat for a minute to ponder the vastness of our country. This landscape speaks to visitors, teasing the timid who stand back in awe and taunting those who challenge its powerful pull. 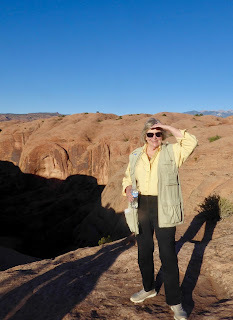 Debi found the view thrilling! Photo by Debi Lander. Judy found the slip rock slippery. Shadows lengthened as we weaved along the paths to our sunset location. Unfortunately, the cloudless sky muted the often dazzling sunsets. Still, the vista took on a golden glow. As the sky dimmed from warm afterglow to low light, the desert developed a somewhat creepy aura. It was time to climb back into the Hummers for a slow headlight light return trip. Participants watching the sunset. Photos by Debi Lander. The effect was better away from the sun. Photo by Judy Wells. We learned from Mike that eagles prey on the pririe dog villages on either side of the road and pause to dine on the highway. Their retreat (take-off for flight) is slow. Cars zipping down the highway at 80-plus mph need to watch out for these magnificent scavengers. And, by the way, no services means zero gas, food or lodging. 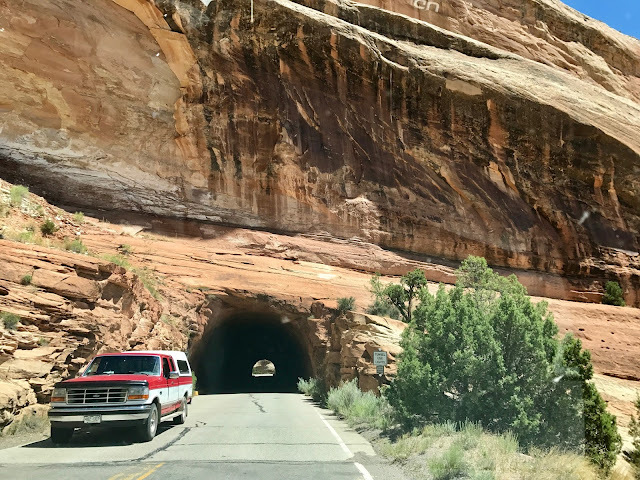 These exits hark back to the time when uranium was mined in the area. The Hummers dropped us back at the Adventure Center after a three-hour unforgettable excursion. A very walkable Moab made for a pleasant stroll to one of the family operated restaurants along Main Street. Eventually, we rambled back to our basic, but adequate and well-located motel - - the Bowen. Watch the video for a taste of the adventure. If you go: Getting to Moab. From the East, we flew into Denver, leased a rental car, then drove over four hours to Grand Junction. 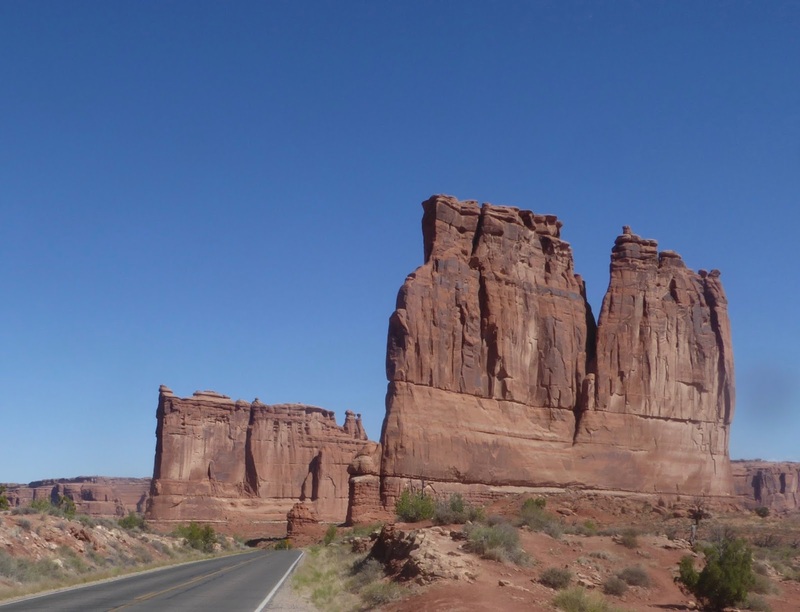 We left there the next day for Moab, a one-and-a-half-hour drive. Grand Junction offers a regional airport and Moab a tiny one, but flights are more expensive. Flying into Salt Lake City, Utah is another option, requiring a three-hour drive. The Hummer tour in the untamed landscape of Hell’s Revenge is not for the faint of heart, however, it appears to be safe. We saw no white knuckles in our group. 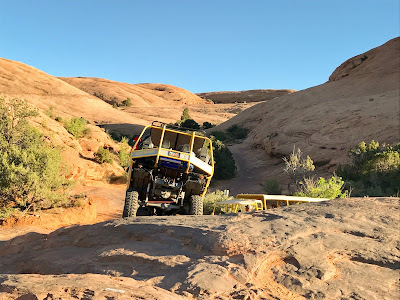 We both agree that attempting to self-drive ATV’s or 4x4 Jeeps tours through the canyons is too much. Leave the driving to the experienced. Disclosure: Our adventures in Moab and Utah, including the Hummer Tour, were self-funded. 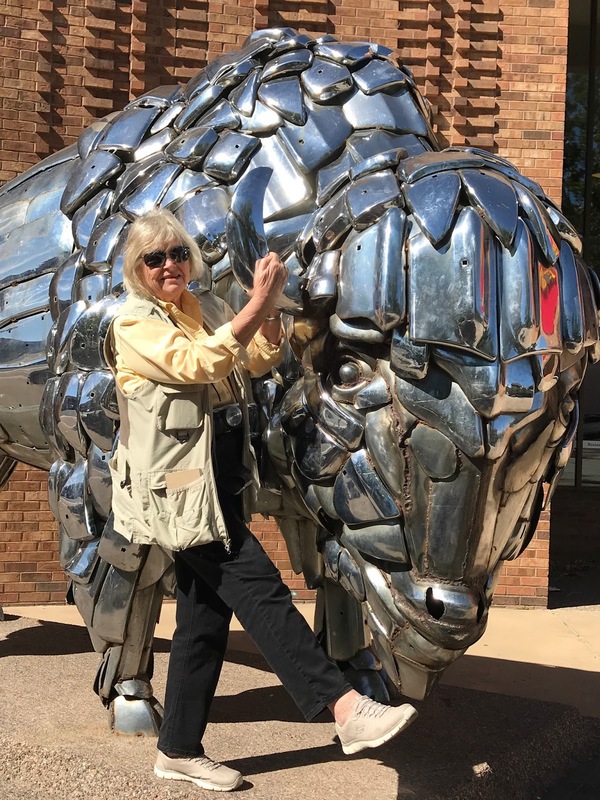 The Eastern Chapter of the Society of American Travel Writers was meeting in Sheridan, Wyoming, and our friend Gaylene Ore suggested we stop en route to see her territory in Colorado which is all the Good Girls needed to start planning our 2017 road trip. 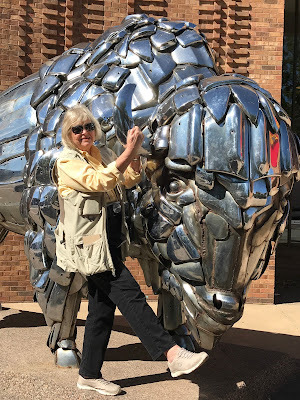 Most appropriate as a travel writers' meeting in South Dakota inspired this site, our moniker and these annual jaunts six years ago. We invited you to come along then and hope you are still riding along today. #Good Girls Westward Ho! Day 1, June 12, 2017: We're stopping here why? From this to the jail? Photo © by Judy Wells. After flying into Denver and picking up a rental car, our GPS steered us through mountains, Vail Village where Judy waxed nostalgic over idyllic summers, past the turnoff for Aspen where Debi recalled ski trips, through Grand Junction's lengthy homelier side, dumping us a what it said was our destination, the driveway of the county jail. Relying on our hostess Gaylene Ore more than electronics, we eventually landed correctly, in a well-equipped room at the Springhill Suites Hotel. It got better. Grand Junction Visitors Bureau left a tote bag of goodies welcoming the Good Girls. Pie improves everything. Photo © by Judy Wells. After a day of 1/2-ounce packs of airplane peanuts or pretzels, a whole dinner anywhere would have been good but at Bin 707 it was superb. 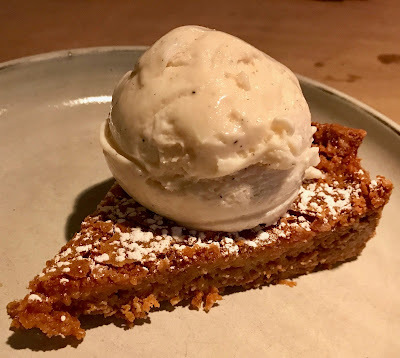 Fried artichoke hearts were intriguing, the lamb tenderloin was beyond good and a slice of Momofuku's pie with its ground oatmeal cookie crust was too rich for even the Good Girls to finish. A quick stop at the hotel breakfast buffet and we hit the streets of downtown Grand Junction for real revelation. Flowers and fountains brightened the wide streets. Art on the Corner added interest everywhere around the restored 19th century storefronts. Apt entrance to the West, 19th century facades. Photo © by Judy Wells. Sculpture to look at and play with. Photo © by Judy Wells. Best of all, on a Tuesday morning, the many cafes were bustling with business. Customers sat outside, often with dogs at their feet. 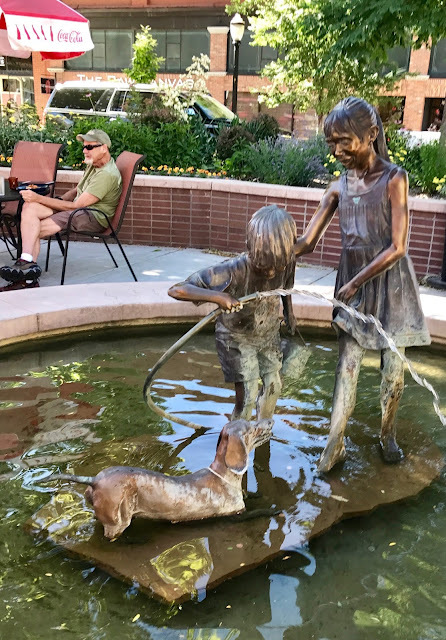 Mothers shared coffee while their children played around fountains and climb-on-me sculpture. Older residents lingered over bagels. 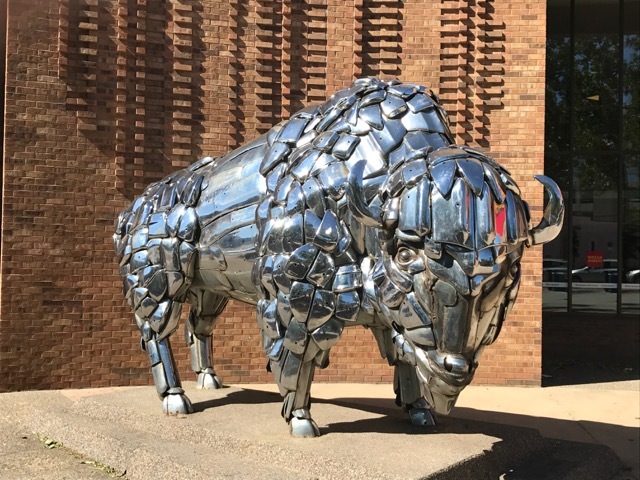 That's one large shiny bison. Photos by Debi Lander. We resisted adding retail therapy to our itinerary, but stopped by Cafe Sol to pick up wraps, salad, desserts and beverages for lunch. Not quite ready. Photo by Debi Lander. Next stop, Two Rivers Winery & Chateau, a lovely pale stone complex complete with B&B. They currently ship 12,000 to 14,000 cases a year to 20 states. 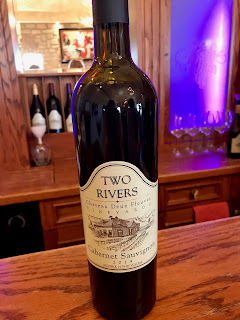 We liked the cabernet. Gaylene suggested we spend several hours visiting Colorado State Monument but thinking in terms of a statue of some kind, we wondered how much time seeing a monument could possibly take. 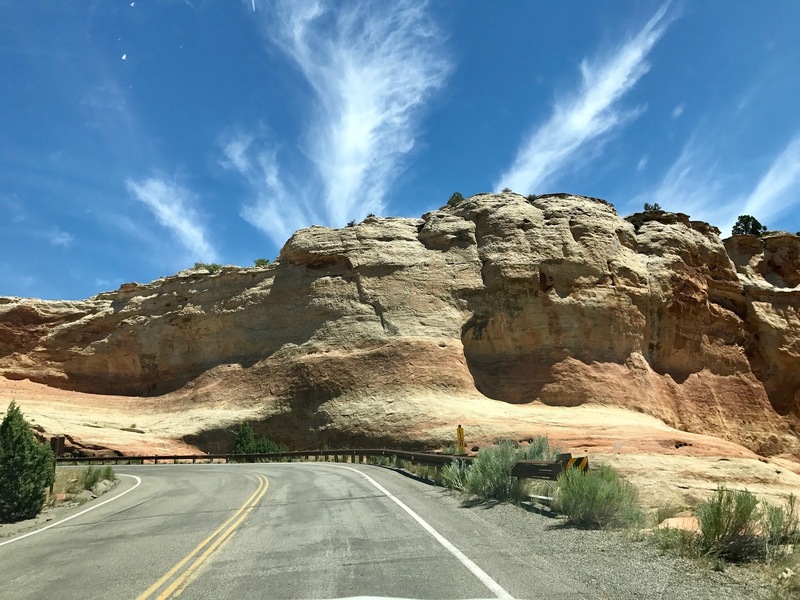 Imagine our surprise when we drove into what was more like a national park with spectacular scenery and clouds that vied for attention. There was a photograph demanding to be taken at every turn in the road and there were many of those. Not crowded either. Sometimes there is an advantage to not having a clue. Our reactions were stunned delight. 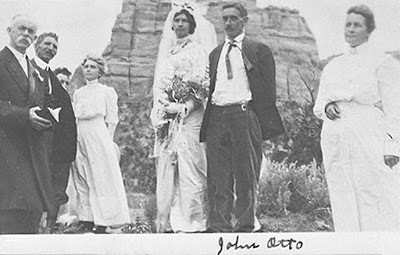 Unlike the stunned horror of Beatrice Farnham, the young Boston artist who was briefly the wife of John Otto, the man responsible for protecting this piece of irreplaceable territory. He wanted to live life in the open, visiting every inch of his spot of heaven. As the brief bride said, "I tried hard to live his way, but I could not do it, I could not live with a man to whom even a cabin was an encumbrance." 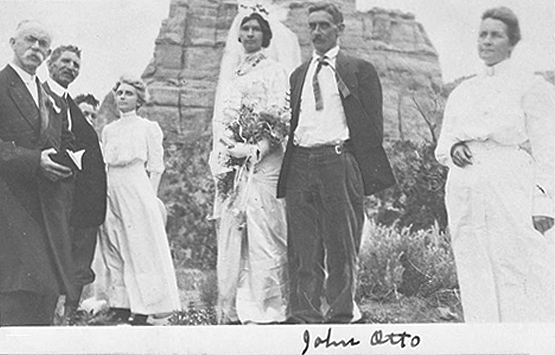 We felt sorry for her but grateful for Otto's dogged dedication. And to Gaylene for introducing us to this monument. 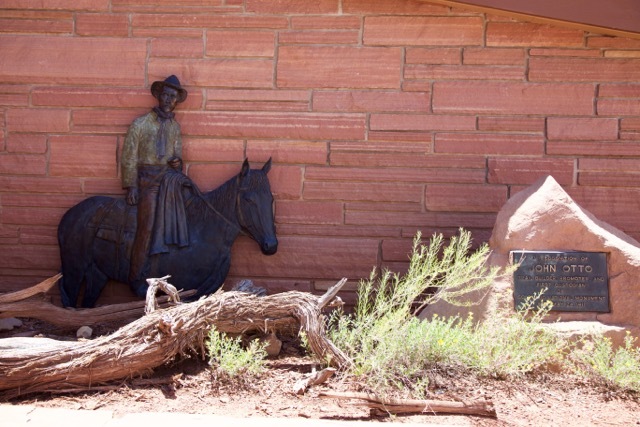 Art and life combine in this image of John Otto against the side of the Visitors Center. Photo by Debi Lander. 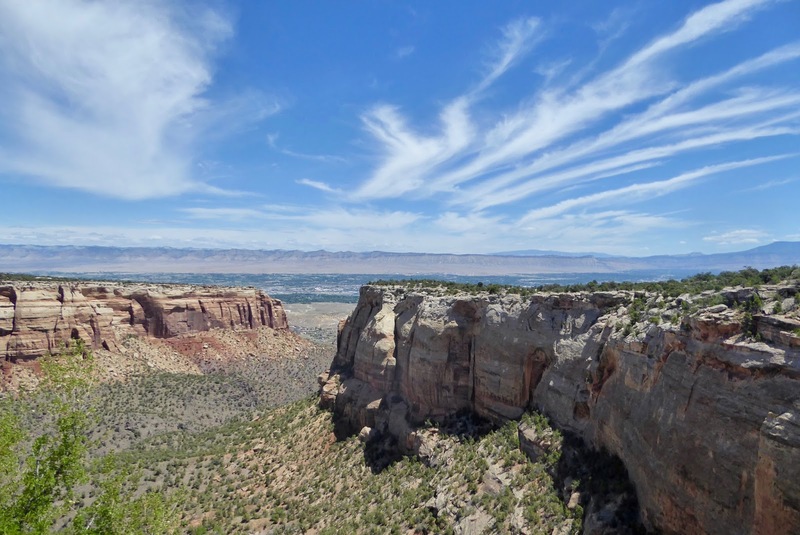 If you have a choice of approaching from the east or west, choose the east, Grand Junction, gate. That puts most scenic pull offs on your right. Trust us, you will use them!